This week’s post concludes the coverage of my Summer Reads selection; a record number of authors (7/12) have joined me on the Literary Sofa and I’m very grateful to all of them for their fantastic pieces and all of you for your interest and positive feedback. One of the best things about running the blog is knowing that readers really do buy and enjoy books as a result of discovering them – and the people and stories behind them – here. 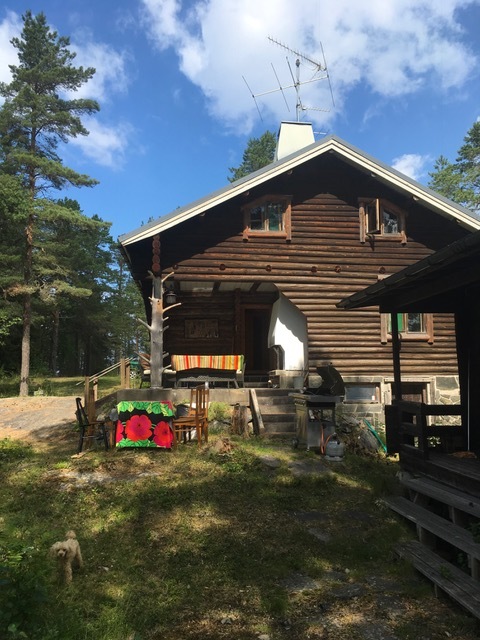 The legend surrounding my grandparents’ summer house is that they bought it from a man in his sixties who had basically built it with his own two hands. 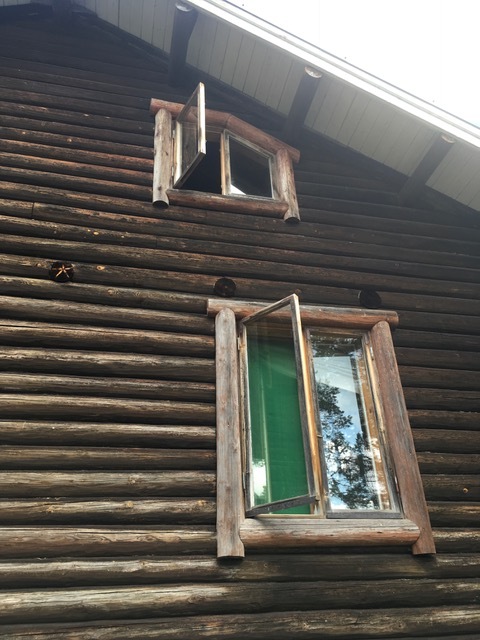 He drew the blueprints with perfect, thin lines, he laid the foundation, he dragged the logs from the forest, planed them, did the plumbing, the pipes, made all the windows, all the small details, including the cupboards in the kitchen. I say ”legend” because of course I don’t know exactly how much of this is true. (Surely you can’t lay a concrete foundation by yourself?) But people who knew the man said he didn’t want any help. They would come up to the house and follow his work, but he would ask them to leave. But when he was finished, after years planning and constructing and probably dreaming about constructing, he became ill. He and his wife had been living in a smaller cabin next door for all those years. According to some, the couple had started drinking, and the cold winters and long working hours had been too much for their health. They never got to live in this amazingly ambitious log house that they had built, and so my grandparents bought it. This was in the Seventies. It’s not a small house and can easily accommodate at least two big families. When I was a child my family would stay here for a few weeks every summer. I think the place is magical, well aware that most people feel that way about places they knew as children; but still, it feels special. 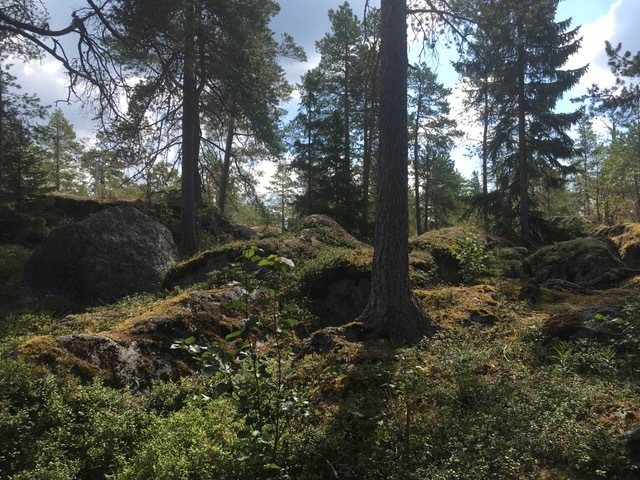 There is a Brothers Grimm kind of forest behind the house with green moss on grey boulders, pine trees full of character, and blueberry bushes. The type of forest that makes it seem perfectly reasonable that people used to believe in trolls and fairies. There are so many small details in the house, beautiful carpentry, and a lot of quirkiness, like the small dining area on a rock next to a small pond, with furniture made of old crooked pine. And there’s the sea. The sea that sounds like a busy highway, especially on windy days. Or should it be the other way around, that the highway sounds like the sea? I knew I wanted to return to this place in a novel. 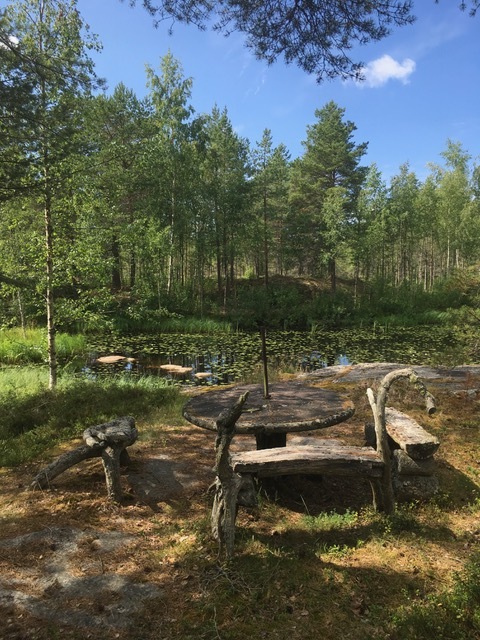 Part of it is economical writing – why make up a fictional setting when I have this place, the sense of it, all the paths in the woods, the pastel palette of the Finnish midsummer night, in my inner eye? People go to therapy so that they can visit their childhood. This was sort of the same thing. No matter what the story, as a small treat to myself I would revisit this place. The real house had not been used for a decade. My cousins would come out for a week every summer, and we would make occasional visits, but if we wanted to stay overnight, or for a longer period, it would have required more cleaning and upkeep. After my grandmother died the house was filled with her belongings: furniture, books, old rugs, stuff that nobody really wanted to throw away but that nobody laid claim to either. So the summer house became sort of a storage house. When my cousins arrived, they didn’t seem to mind, they just put down their luggage and lived among all this clutter. But something had to be done. Last summer we started to go through all the stuff, sorted out the things that had value or history, and drove the rest to the flea market. I have some experience with old houses. A couple of years ago I bought an old house from a family of siblings in their 60’s who had lived there together as children. Their brother, now a unemployed truck driver, “came with the house” when I bought it, as his siblings said. So he was my tenant for a couple of months until he eventually moved out and I started renovating (when he called me to say he was moving ”far away”, I was a little startled. Apparently he moved to Thailand). I put in a used wooden floor that I bought online. Piecing the old floorboards together was like solving a puzzle, because none of them were straight. I planed the wood, sanded it, painted the walls, the ceilings, everything that needed to be done so that the place would become how I imagined it. I would say that it was like writing a story, except it was nothing like that, because working with your hands is very different to writing. I think that the flow you get into, when you work for ten, twelve hours a day, for many weeks, when you just eat and sleep and think about what’s next in the process, is a kind of meditation. It’s not intellectual. So when we decided to do something about the situation in my grandparents’ old house it was familiar work. I ripped away the old plastic rug in the bedroom, that had been installed sometime in the eighties, and under it I found a unplaned wooden floor, what we call a ”raw floor” in Swedish. I sanded it down and painted it a greyish light green. It took a week or so, and because we already had cleaned the house, we were ready to move in. When I was writing my novel The Summer House, a few years earlier, I didn’t know what the destiny of this house would be. It was always standing there, in the forest, next to the sea, ready to come alive again. 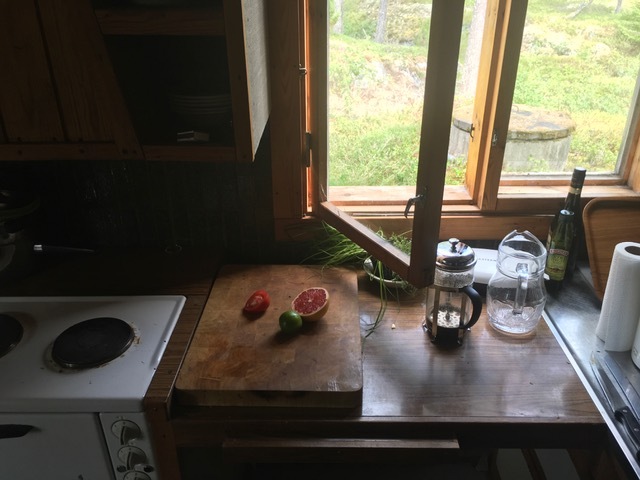 Now I am sitting in the kitchen of the house – which is so clearly made by someone who loved joinery – and I am writing this. It has been a warm and dry summer. The sea is warm in the way that I remember from when I was a child. But mostly we talk about how this heat is not normal, that climate change is a fact. My novel has a lot of rain, water, water pouring out from everywhere, running in streams in the muddy road. Maybe because that’s how I remembered this place. But now, when I sit here in the heat, I see that there is another story. 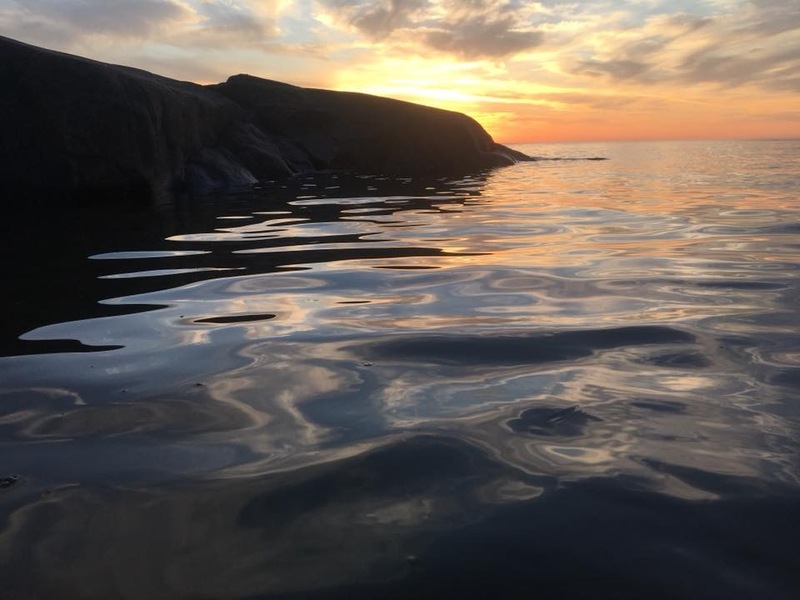 If I were to write a second novel about this place it would be dry, like the summer of 2018 has been, with Finland and Sweden full of wildfire. We’re hoping for rain tomorrow. Thank you so much to Philip for this enchanting and atmospheric piece and for the lovely photographs. Considering how much I’ve travelled, it’s crazy that I’ve never been to Scandinavia – time to do something about that! The angle for today’s review came about when I noticed the very different titles of this novel in English translation and the original Swedish. That’s an interesting story in itself (you’ll see), but between them, the two titles encapsulate my reasons for recommending it. 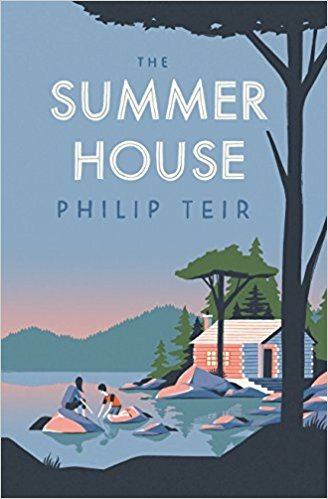 The literal English title The Summer House – together with the beautiful classy cover – makes perfect sense for a book with such a genuinely transporting sense of place and languid summer vibe. (I read it in my garden on one of the first hot weekends of the year and really felt like I’d been on holiday.) Both make a refreshing change to the scorching Mediterranean type imagery many British readers associate with summer, although this year we haven’t needed to leave home for that. The natural environment is more than a setting here; it is a theme and one of many sources of tension. This brings me to the Swedish title, which Philip told me is the translation of This is the way the world ends, a line repeated three times in the last stanza of T S Eliot’s poem The Hollow Men (final line: Not with a bang but a whimper.) This is far more dramatic and ominous, and more representative of the depth in evidence here. 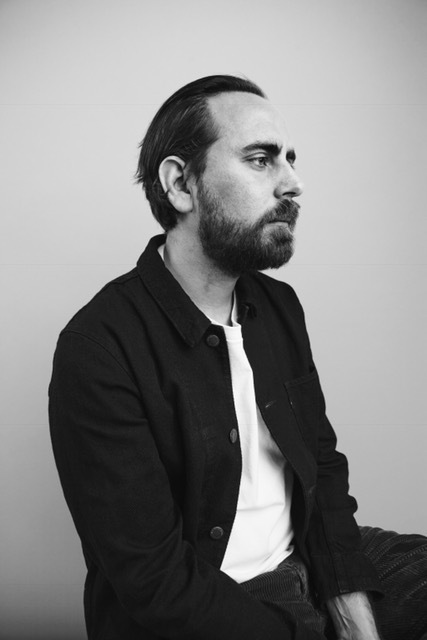 As in his debut The Winter War, Teir excels at drawing unique characters animated by anxieties and preoccupations which are intensely personal but also universal; relationships, society, the environment. Although the brilliant casting and set-up could have delivered a bigger pay-off in terms of narrative arc, it offers more subtle rewards in the form of entertaining food for thought. This is a stimulating and articulate novel driven by character and ideas, and is thus inevitably more about questions than answers. We visit a new place, meet new people, and get to see the world in a slightly different way. I like that. That’s what good books do. As the Summer Reads series has run over and I am very keen to take August off writing, blogging and anything else I can get out of, instead of the normal post on my intended Poolside TBR, I am going to do a cover gallery at the start of next week. I will however follow up in September with the usual verdict on anything I read over the break. Interesting post, Philip and Isabel. I think the Swedish title makes more sense given the discussions of climate change among the characters and the overall denial about how bad things can get. I agree, Anne, although I think the packaging and title of the UK version are more likely to sell here in these particularly doomladen times! Fantastic post thanks for writing and sharing. I could do with some of your advice. God Bless.